The Khyber Pass (Pashto: د خیبر درہ‎, Urdu: درۂ خیبر‎) is a mountain pass in the northwest of Pakistan, on the border with Afghanistan. It connects the town of Landi Kotal to the Valley of Peshawar at Jamrud by traversing part of the Spin Ghar mountains. An integral part of the ancient Silk Road, it has long had substantial cultural, economic, and geopolitical significance for Eurasian trade. Throughout history, it has been an important trade route between Central Asia and South Asia and a vital strategic military choke point for various states that came to control it. The summit of the pass is 5 km (3.1 mi) inside Pakistan at Landi Kotal, while the lowest point is at Jamrud in the Valley of Peshawar. 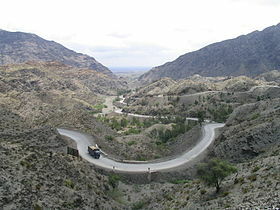 The Khyber Pass is part of Asian Highway 1 (AH1). The pass connects Landi Kotal to the Valley of Peshawar. In a number of editions of the Indo-Aryan Migration Theory, the Indo-Aryans began relocating to India through the Khbar Pass. 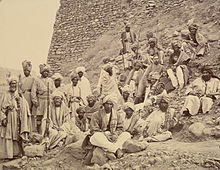 Well-known invasions of the area have been predominantly through the Khyber Pass, such as the invasions by Cyrus, Darius I, Genghis Khan and later Mongols such as Duwa, Qutlugh Khwaja and Kebek. Prior to the Kushan era, the Khyber Pass was not a widely used trade route. The Khyber Pass became a critical part of the Silk Road, which connected Shanghai in the East to Cádiz on the coast of Spain. The Parthian and Roman Empires fought for control of passes such as these to gain access to the silk, jade, rhubarb, and other luxuries moving from China to Western Asia and Europe. 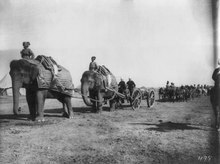 Through the Khyber Pass, Gandhara (in present-day Pakistan) became a regional center of trade connecting Bagram in Afghanistan to Taxila in Pakistan, adding Indian luxury goods such as ivory, pepper, and textiles to the Silk Road commerce. Among the Muslim invasions of the Indian subcontinent, the famous invaders coming through the Khyber Pass are Mahmud Ghaznavi, and the Afghan Muhammad Ghori and the Turkic-Mongols. Finally, Sikhs under Ranjit Singh captured the Khyber Pass in 1834 until they were defeated by the forces of Wazir Akbar Khan in 1837. Hari Singh Nalwa, who manned the Khyber Pass for years, became a household name in Afghanistan. To the north of the Khyber Pass lies the country of the Mullagori tribe. To the south is Afridi Tirah, while the inhabitants of villages in the Pass itself are Afridi clansmen. Throughout the centuries the Pashtun clans, particularly the Afridis and the Afghan Shinwaris, have regarded the Pass as their own preserve and have levied a toll on travellers for safe conduct. Since this has long been their main source of income, resistance to challenges to the Shinwaris' authority has often been fierce. For strategic reasons, after the First World War the British built a heavily engineered railway through the Pass. The Khyber Pass Railway from Jamrud, near Peshawar, to the Afghan border near Landi Kotal was opened in 1925. During World War II concrete "dragon's teeth" (tank obstacles) were erected on the valley floor due to British fears of a German tank invasion of British India. The Pass became widely known to thousands of Westerners and Japanese who traveled it in the days of the hippie trail, taking a bus or car from Kabul to the Afghan border. At the Pakistani frontier post, travelers were advised not to wander away from the road, as the location was a barely controlled Federally Administered Tribal Area. Then, after customs formalities, a quick daylight drive through the Pass was made. Monuments left by British Army units, as well as hillside forts, could be viewed from the highway. The area of the Khyber Pass has been connected with a counterfeit arms industry, making various types of weapons known to gun collectors as Khyber Pass copies, using local steel and blacksmiths' forges. The pass was serviced by the Khyber Pass Railway, currently closed. During the war in Afghanistan, the Khyber Pass has been a major route for resupplying military armament and food to the NATO forces in the Afghan theater of conflict since the US started the invasion of Afghanistan in 2001. Almost 80 percent of the NATO and US supplies that are brought in by road were transported through the Khyber Pass. Furthermore, it has also been used to transport civilians from the Afghan side to the Pakistani one. Until the end of 2007, this route had been relatively safe since the tribes living there (mainly Afridi, a Pashtun tribe) were paid by the Pakistani government to keep the area safe. However, since that year, the Taliban began to control the region, and so there started to exist wider tensions in their political relationship. Since the end of 2008, supply convoys and depots in this western part have increasingly come under attack by elements from or supposedly sympathetic to the Pakistani Taliban. In January 2009, Pakistan sealed off the bridge as part of a military offensive against Taliban guerrillas. This military operation was mainly focused on Jamrud, a district on the Khyber road. The target was to “dynamite or bulldoze homes belonging to men suspected of harboring or supporting Taliban militants or carrying out other illegal activities”. The result meant that more than 70 people were arrested and 45 homes were destroyed. In addition, two children and one woman were killed. As a response, in early February 2009, Taliban insurgents cut off the Khyber Pass temporarily by blowing up a key bridge. This increasingly unstable situation in northwest Pakistan, made the US and NATO broaden supply routes, through Central Asia (Turkmenistan, Uzbekistan and Tajikistan). Even the option of supplying material through the Iranian far southeastern port of Chabahar was considered. 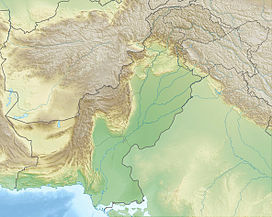 In 2010, the already complicated relationship with Pakistan (always accused by the US of hosting the Taliban in this border area without reporting it) became tougher after the NATO forces, under the pretext of mitigating the Taliban's power over this area, executed an attack with drones over the Durand line, passing the frontier of Afghanistan and killing three Pakistani soldiers. Pakistan answered by closing the pass on 30 September which caused a convoy of several NATO trucks to queue at the closed border. This convoy was attacked by extremists apparently linked to Al Qaida which caused the destruction of more than 29 oil tankers and trucks and the killing of several soldiers. NATO chief members had to issue a formal apology to the Pakistan government so the supply traffic at this pass could be restored. In August 2011, the activity at the Khyber pass was again halted by the Khyber Agency administration due to the more possible attacks of the insurgency over the NATO forces, which had suffered a period of large number of assaults over the trucks heading to supply the NATO and ISAF coalitions all over the frontier line. This instability made the Pakistan Oil Tanker Owners Association demand more protection from the Pakistani and US government threatening not to supply fuel for the Afghan side. A suburb of Civil Lines, Delhi, India, is named after this pass. 'Khyber Pass' is Cockney rhyming slang meaning 'arse'. This use is alluded to in the 1968 film Carry On Up the Khyber. Khyber Pass Road is a major road in the suburb of Newmarket, Auckland, New Zealand. An artificial rockwork feature at East Park, Kingston upon Hull, UK. A steep and twisting road up the West Cliff at Whitby, UK. Khyber Pass Pub in Philadelphia, Pennsylvania. The podcast Twilight Histories has an episode called "Napoleon in Afghanistan" which partly takes place in the Khyber Pass. The Vampire Weekend song "M79" references the Khyber Pass. The Tom Cochrane song "Life Is a Highway" (covered by Rascal Flatts and others) references the Khyber Pass. The album Rio Grande Blood by Ministry (2006) has a song called "Khyber Pass" which references it as a possible hiding place for then missing and at large Osama bin Laden. This song was also featured at the end of the film The Hurt Locker. Referenced in the song "Red War" by Probot, featuring Max Cavalera on vocals. A spa hotel in Gulmarg Jammu and Kashmir is named Khyber Himalayan Resort and Spa. 'Khyber Pass' is a mountain bike trail connecting the Top of the World trail at Whistler Resort to the Whistler Creekside Village. Parts of the 1985 Jay McInerney book Ransom take place in or near the Khyber Pass. ^ Tarn, William Woodthorpe (2010). The Greeks in Bactria and India. Cambridge University Press. ISBN 9781108009416. Retrieved 28 March 2017. ^ Insight Guides Silk Road. Apa Publications (UK) Limited. 2017. p. 424. ISBN 9781786716996. ^ Arnold, Guy (2014). World Strategic Highways. Routledge. p. 12. ISBN 9781135933739. Retrieved 4 February 2019. ^ Docherty, Paddy (2008). The Khyber Pass: A History of Empire and Invasion. Union Square Press. p. 74. ISBN 9781402756962. Retrieved 4 February 2019. ^ The Khyber Pass: A History of Empire and Invasion – Paddy Docherty – Google Books. Books.google.co.in. Retrieved on 2013-07-12. ^ Hari Singh Nalwa, "champion of the Khalsaji" (1791–1837) – Vanit Nalwa – Google Books. Books.google.co.in. Retrieved on 2013-07-12. ^ "Introducing The Khyber Pass". Lonelyplanet.com. 2009-03-24. Archived from the original on 2011-06-07. Retrieved 2010-11-12. ^ OPPEL Jr, RICHARD A. (2 January 2009). "Pakistan Briefly Reopens Key NATO Supply Route". The New York Times. Archived from the original on 20 May 2013. Retrieved 18 June 2012. ^ "Pakistan and Afghanistan". Institute for the Study of War. Archived from the original on 9 February 2012. Retrieved 18 June 2012. ^ "Pakistan Reopens Khyber Pass To US/NATO". Archived from the original on 24 July 2012. Retrieved 18 June 2012. ^ Karin Brulliard (October 9, 2010). "Pakistan reopens border to NATO supply trucks". Washington Post Foreign Service. Archived from the original on 9 February 2011. Retrieved 18 June 2012. ^ Ahmad Nabi (August 17, 2011). "Nato supplies via Khyber Pass halted due to security". Archived from the original on 11 January 2012. Retrieved 18 June 2012. ^ McNally, Frank. "The Irish Times". The Irish Times. The Irish Times. Retrieved 29 August 2018. ^ Khyber Pass Map Archived 2011-10-30 at the Wayback Machine. Mapsofindia.com (2013-03-01). Retrieved on 2013-07-12. ^ Khyber Pass Delhi – Google Maps. Maps.google.co.uk (1970-01-01). Retrieved on 2013-07-12. ^ "East's Eden". Kingston upon Hull City Council. September 2002. Archived from the original on 2013-05-17. ^ Historic England. "Details from listed building database (1001519)". National Heritage List for England. Retrieved 14 January 2013. Molesworth, Lt-Gen. G.N., Afghanistan 1919 (Asia Publishing House, 1962). This book describes in detail the author's passage (Prince Albert's) Somerset Light Infantry.